Article updated at 4:16 p.m. EDT. FREMONT, Calif. -- The sprawling mud flats, salt ponds, sloughs and marshes at the southern end of San Francisco Bay teem with hundreds of thousands of shorebirds and waterfowl every spring and fall. The Don Edwards San Francisco Bay National Wildlife Refuge wetlands are a paradise for nature lovers -- but it's not all natural. Earthen levees tended by a clamshell dredge create a watery maze and serve as a reminder of the bay's historical role as a hub for industrial salt production. As far back as the 1850s, salt-making operations ruled the edges of the southern bay. Saltworks staked out spots in the marshes and built levees that severed wetlands from the bay, creating networks of industrial ponds. By the late 1970s, salt production had consolidated from small, scattered operations into one large one ultimately run by international food and commodities goliath Cargill Inc. And conservationists looking to protect dwindling wetlands and revitalize degraded marshes began eyeing old saltworks as restoration opportunities. Today, former saltworks are home to the West Coast's largest tidal wetlands restoration effort, covering an area the size of Manhattan. The big win for conservation came in 1972 with the creation of the Don Edwards refuge, one of six in the Bay Area and the nation's first urban wildlife refuge. Another major victory came in 2003 when Sen. Dianne Feinstein (D-Calif.) orchestrated the purchase of 15,100 additional acres of salt ponds in the South Bay, which have gradually been undergoing restoration. Restoring salt pond to wetland is a relatively low-cost and lowbrow undertaking. Often, all that's needed is to remove a crumbling levee and let bay water return. Don Edwards San Francisco Bay National Wildlife Refuge – 30,000 acres of restored salt ponds, tidal marsh and mudflats – is one of the country’s largest urban refuges. It offers habitat for nine threatened or endangered species and 227 species of birds. Photo by Debra Kahn. But the saltworks also offer opportunities for developers who see them as potential high-end real estate. And that's how one of two remaining industrial saltworks here became the focus of a pitched battle between environmental groups and residential developers. What began years ago as a local land-use dispute has exploded into a brawl over the Clean Water Act's regulatory reach. After years of courtroom battles about federal jurisdiction over the region's salt ponds, the Army Corps of Engineers' top lawyer last year quietly accepted Cargill's argument that the brine in its ponds doesn't meet the definition of "water" under the 1972 law -- a new and controversial legal interpretation. The regulatory questions have entangled the Army Corps and U.S. EPA, the country's top water regulator, at a critical moment as the Obama administration pushes forward with a contentious rule aimed at clearing up years' of confusion over the Clean Water Act's reach. And even as the combatants try to keep the salt pond fight local, what happens here could ripple across the country. 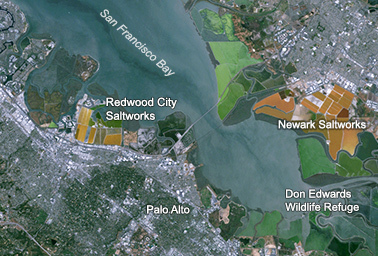 For years, environmentalists have had their eyes on Cargill's saltworks in the Silicon Valley municipality of Redwood City. They narrowly missed acquiring the tract in the 2003 deal when the federal funding shrank, but the refuge did receive congressional authorization to add the site's 1,433 acres to its portfolio. But Cargill has other ideas for that property. 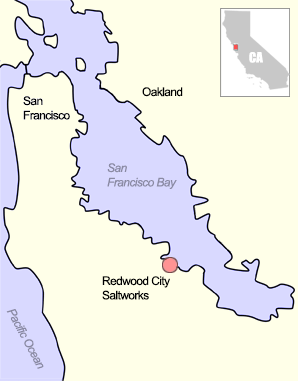 The Redwood City Saltworks is in the heart of Silicon Valley, about 25 miles south of San Francisco. Map by Andrew Holmes. In 2009, the company and developer DMB Pacific Ventures proposed a mixed-use, high-density development of between 8,000 and 12,000 residences, 200 acres of parks and 400 acres of restored marsh. There are few U.S. housing markets hotter than Silicon Valley's, and the developers were looking to capitalize. The median sale price for a house in Redwood City is $1 million, up from $780,000 in 2010. Facebook Inc. is expanding its Frank Gehry-designed campus just down the road in Menlo Park on a former industrial site adjacent to the bay -- a move likely to drive up housing demand. "Second only to Manhattan, this is the most out-of-whack, housing-constrained, overpriced [region]," said David Smith, senior vice president for DMB Redwood City Saltworks. "That's why we have stayed so engaged with this site; it is unprecedented in its ability to bring solutions to this area." Smith maintained the DMB plan had something for everyone. Not only would it bring new housing, it also would provide flood-control benefits for communities, public transportation benefits and a significant wetlands restoration component. "Good times are bad for the bay," said Florence LaRiviere, 91, who corralled support for the original 1972 bill that created the refuge and a 1988 bill that doubled the amount of land it could acquire. One of the marshes near the entrance to the refuge, LaRiviere Marsh, bears her name. Environmental groups saw the development project as a step backward, reversing a 40-year trend of preserving wetlands instead of filling them in. They engaged in a three-year campaign involving direct mail, community polling and getting elected officials from as far as 90 miles away to go on the record opposing the development. "People in the Bay Area consider an attack on one part of the bay to be an attack on the whole bay," said David Lewis, executive director of the nonprofit Save the Bay. Amid the controversy, DMB withdrew the plan from consideration by the Redwood City City Council in May 2012, saying it intended to go back to the drawing board and come up with a scaled-down proposal. The move wasn't purely political. 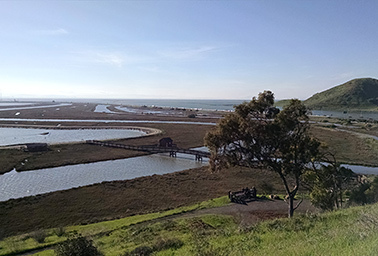 South San Francisco Bay’s tidal marshes were carved up for salt ponds and industrial facilities more than 150 years ago. Today, all but two saltworks sites are in public ownership and in the process of being restored. Landsat satellite image courtesy of the U.S. Geological Survey. Behind the scenes, Cargill and DMB had spent 2½ years negotiating with the Army Corps and EPA over permitting for the site, which today is used as finishing ponds for making salt. Developers must get permits from the Army Corps if they want to fill streams, wetlands and ponds covered by the Clean Water Act, as well as permits for affecting navigable waters under the Rivers and Harbors Act. Those permits can require developers to shrink or redesign their plans to minimize environmental harm. They can also require repairs of damaged streams and wetlands to offset damage caused by development. In some cases, those permit terms can fundamentally alter the financial viability of a project. Cargill, the Army Corps and environmentalists have been arguing for years over the federal government's authority over the ponds and other complexes at saltworks sites. Between 1971 and 2007, at least 18 lawsuits were filed over the issue. To understand why this tract was so complicated requires some understanding of salt making. Salt makers draw bay water into large evaporator ponds, where it sits exposed to the sun and wind. Over time, as the liquid becomes more saline, it gets moved farther through the network of ponds. Then, after about five years, the brine is moved to basins for the final stage of processing, where chunks of sodium chloride are harvested. The final stages of salt production take place at Cargill’s Redwood City site, where heavy equipment scrapes up and moves chunky rock salt after it drops out of the brine. Photo courtesy of Redwood City Saltworks. The Army Corps' San Francisco District has regularly ruled all of these sites as jurisdictional. 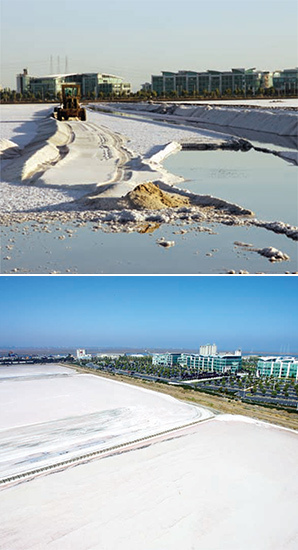 Paperwork supporting a series of determinations made in 2007 for former salt ponds that were being restored shows that corps regulators saw the ponds as fitting into three different categories, any one of which would have made them jurisdictional under the agency's regulations. "This is nothing but bay water running through a series of ponds," said Peter Baye, a former regulator for the San Francisco District who now consults for Save the Bay. He said that water in Cargill's ponds regularly connects with the San Francisco Bay through rainfall and overtopping of the levees. Cargill, on the other hand, has maintained that the ponds fall outside the scope of the Clean Water Act. The company argues that any wetlands were filled long before the law's passage and that today levees hydrologically separate all the ponds and basins from the bay. But in the interest of avoiding a protracted battle over the Redwood City site, Cargill and DMB agreed to set aside the question of jurisdiction and negotiate with the corps and EPA in hopes of getting agreement on a permit. "We came to that table in good faith," DMB's Smith said. "We didn't think it would be easy. We didn't expect to get any kind of pass, but there was enough land and potential on these 1,400 acres to do a project with significant solutions that's fully mitigated and compliant with the Clean Water Act on the site." But through years of discussion, Smith said progress was hamstrung by unresolved questions about federal jurisdiction. Three weeks after the developers withdrew their initial plan from the city's consideration in 2012, they asked EPA and the corps for a full, official jurisdictional determination. Along with that request, DMB and Cargill also submitted a document laying out their case for why the Redwood City site should not be deemed jurisdictional under either the Clean Water Act or the Rivers and Harbors Act. How does the CWA define 'water'? In that document was a footnote that caught the attention of the corps' top lawyer, Earl Stockdale. That note states that by the time that brine is transported to the Redwood City site, following years of treatment, the liquid is actually considered a pollutant under a separate section of the Clean Water Act. • Leslie Salt Co. v. Froehlke, 1973 -- The San Francisco-based 9th U.S. Circuit Court of Appeals ruled against Leslie Salt's challenge to federal jurisdiction over its diked evaporator ponds, arguing that if San Francisco Bay water warranted protection outside Leslie's floodgates, it still warranted protection after passing through them. • Cargill Inc. v. United States, 1995 -- A Northern California federal judge ultimately ruled that shallow, out-of-production basins once used to crystallize salt were jurisdictional because migratory birds landed in the rainwater that ponded there. The Supreme Court declined to take up Cargill's appeal, but Justice Clarence Thomas wrote a dissent raising doubts about the agencies' so-called Migratory Bird Rule. • Solid Waste Agency of Northern Cook County v. Army Corps of Engineers, 2001 -- The Supreme Court ruled in a 5-4 decision that the presence of migratory birds was not, in itself, enough to rule a water jurisdictional under the Clean Water Act. • Rapanos v. United States, 2006 -- The Supreme Court ruled 5-4 against the Army Corps' broad approach to claiming jurisdiction, but Justice Anthony Kennedy, who joined the majority, set his own test for jurisdiction in a stand-alone opinion. The case set off a cascade of jurisdictional confusion (Greenwire, Feb. 7, 2011). • San Francisco Baykeeper v. Cargill, 2007 -- The 9th Circuit ruled that a heavily saline waste pond nestled inside a wildlife refuges fell outside federal jurisdiction because the migratory bird connection was no longer sufficient and the Army Corps' regulations only named adjacent wetlands as jurisdictional and not other adjacent waters like ponds. The Redwood City site's crystalizer ponds are home to the final phases of salt production where chunks of salt drop out of the brine. After this "precipitation," the remaining liquid is moved away, and heavy bulldozers and other equipment come in to scrape and move the salt. In a January 2014 legal guidance memo, Stockdale, then the corps' chief counsel, wrote that liquids at the Redwood City site raise a fundamental question: "What kind of liquids constitute 'water' as that term would be understood by the majority of the Supreme Court?" Stockdale, who retired at the end of 2014, acknowledged that the term "water" within the Clean Water Act must be broader than just H2O. The law was presumably intended to cover the Cuyahoga River, whose burning in 1969 brought a groundswell of public concern that led to the law's passage, even though that river clearly was "not a pure, unadulterated water," he wrote. Still, Stockdale argued that the liquids at the Redwood City site don't meet the definition. "Other than being in an aqueous form and being originally derived from Bay waters, the liquids on the Redwood City site are more commonly understood to be a chemical used in, or a byproduct of, an industrial process," he wrote. The liquids there are "chemically distinguishable, ecologically distinguishable, and legally distinguishable from the Bay waters," he concluded. "They are no longer the type of resource the CWA was intended to protect." Other legal questions about an interstate commerce connection or the site's significance to downstream waters are consequently irrelevant, he wrote, concluding that the Redwood City basins are not jurisdictional. But whose opinion, other than Stockdale's, the memo reflects is unclear. Army Corps spokesman Gene Pawlik said the legal guidance was prepared by Stockdale in coordination with the agency's regulatory and technical experts and that the corps has no plans to withdraw it. EPA, which has ultimate oversight over Clean Water Act issues and was engaged with the Redwood City determination from the start, wasn't part of the development of the legal memo, its regional office said. Moreover, the memo was never put out for public notice and comment. For a guidance memo like this one, public comment is not required by law, but federal agencies typically see it as good practice when there's significant public interest in an issue. "Cargill basically wrote this for the corps," Save the Bay's Lewis said. "The corps counsel basically took it, and the process doesn't appear to have created an opportunity for other legal opinions to be factored in." The Army Corps stresses that its memo is tailored to a specific site and the legal opinions pertaining to one area aren't necessarily applicable to other sites. But Jan Goldman-Carter, a veteran water lawyer at the National Wildlife Federation, said she had never seen the question of what kind of liquid constitutes a water under the Clean Water Act raised before. She called Stockdale's legal arguments "a real stretch" and "pulled out of the air," unsupported by case law or other legal precedent. Goldman-Carter suggested that Stockdale's argument that waters initially covered by the Clean Water Act can be turned into uncovered waters through industrial intervention fundamentally misunderstands the 1972 law. "That is the whole point of the Clean Water Act -- to maintain and restore and stop pollutants from harming aquatic sites 'originally derived from Bay waters,'" she said by email. "Extending this logic, wetlands and ponds and other diked areas can be contaminated with chemicals and then found nonjurisdictional as the consequence of 'a purposeful industrial process to create a product.'" After two years of waiting, Smith, at DMB, said he received word last spring that his final jurisdictional determination would be ready on May 16, 2014. The day before it was due out, he called the corps to make arrangements to pick up the documents. "I called on the 15th and said, 'I don't mean to be a pain, but I already am, so can I please send a messenger to pick it up whenever appropriate?'" Smith recounted. "They said, 'Funny you should be calling right now.'" The day before, May 14, EPA Region 9 Administrator Jared Blumenfeld in San Francisco had moved to have his agency take over the jurisdictional determination. A 1989 memorandum of agreement between EPA and the corps lays out the process by which EPA can move to take over determinations about federal authority on individual sites, entire regions or particular activities. In instances where EPA wants to make the jurisdiction call, the regional administrator asks EPA headquarters in Washington, D.C., to add it to the "special case list." That's what Blumenfeld did. But EPA headquarters didn't approve the special case request at that time. Instead, the top corps official -- Assistant Secretary of the Army for Civil Works Jo-Ellen Darcy -- undertook her own review of the case. Ironically, DMB and Cargill had asked from the beginning for EPA to be the lead on the jurisdictional determination. "We knew that EPA could have a role if they chose to," Smith said. "So we addressed it jointly to the corps and EPA from day one and asked EPA to be a part of it." Region 9 declined to take the reins in 2012, according to an email from the head of the regional wetlands office sent to Smith and others. But EPA agreed it had a role and committed to "providing timely input" to the corps on the determination. Now, with Darcy's review finished and the Army Corps' headquarters office working toward a final decision "in the near future," opposition to the development project is again flaring. "I'm very concerned about this," Feinstein, the top Democrat on the Senate Appropriations subcommittee that oversees the corps' budget, said at a hearing with Darcy and other corps leaders last month. "What makes our whole area is the bay, and we do not want it filled in." Feinstein, whose work on the salt ponds dates back to her time as San Francisco mayor in the late 1970s and 1980s and who called herself "the mother of the whole salt pond situation," is tracking the issue closely, her office said. To be sure, even if the ponds are ruled nonjurisdictional, there are several more layers of government for the developers to get through, including the Regional Water Resources Control Board, the Bay Conservation and Development Commission and Redwood City itself. But regardless of those hurdles, a finding of no Clean Water Act jurisdiction would likely have big implications for the property's value. "When they finally get through those or don't get through those, they're going to know a lot more about what the value of the land is and whether it's worth more than the value of farming salt on it," said Rick Knauf, executive managing director of real estate developer Colliers International's Redwood City office who is not involved with the Cargill and DMB project. "I think with this kind of a project, you just have to get over one hurdle at a time." Meanwhile, California Democrats in the House are raising concerns over the corps' legal memo. "The Environmental Protection Agency (EPA) is a co-regulatory partner in the Clean Water Act implementation, and needs to be fully consulted in the process of developing policy and legal interpretations of the Clean Water Act Section 404, under which the Corps regulation of the Cargill site would fall," 11 House members from the region wrote in a letter to Darcy last month. The option of EPA taking over the decision on the Redwood City site is still on the table, the corps spokesman confirmed. But the politics aren't easy. EPA and the Army Corps are in the midst of a fierce battle with congressional Republicans and some powerful industry groups over a proposed rule aimed at clearing up years of confusion over the scope of the Clean Water Act following two muddled Supreme Court decisions. Critics of the rule proposal have been quick to point out that EPA has been the face of the effort and raise questions about the corps' buy-in. A move by EPA now to take over the case and rule the Redwood City salt ponds jurisdictional when the corps' legal analysis states that they are not would likely stoke opponents' allegations of an EPA power grab. And if either agency were to rule the Cargill site jurisdictional, the corps' legal guidance could also provide ammunition in a lawsuit by the developers. Add to that the general bureaucratic tendency for agencies to hunker down and protect their own interests. But DMB's Smith said he's not convinced that the current flurry of activity means a decision is at hand. "We've been hoping it was imminent for two years now," he said. "We are repeatedly asked to remain patient."